AUBURN – In Olusegun Fagbohun’s opinion, it is a great time to be a scientist. He believes that advances in his field and others, being made at places like Auburn, herald exciting changes in the world. 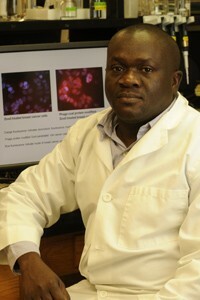 Olusegun is a graduate student in Pathobiology, a graduate department in the College of Veterinary Medicine at Auburn. With his advisor, Dr. Valery Petrenko, he is working on a drug delivery technique that they hope will advance and refine breast cancer treatment. The main concern in treating cancers right now, he says, is minimizing side effects and toxicity to the rest of the body. They have drugs that they know are effective against breast cancers, but the challenge that they are addressing is to deliver the drug most effectively to the breast cancer cells, while avoiding other fast dividing cells such as hair. This is exactly what they are doing, using a technique called phage display technology. Dr. George Smith at the University of Missouri is the “father” of this technology, Olusegun says, but Dr. Petrenko is certainly a pioneer. Bacteriophages, phages in brief, are essentially viruses that attack bacteria. These phages are covered with a protein layer that scientists can manipulate. It is possible to engineer the phages to display the proteins as peptides, which all possess binding properties for various molecules. What Dr. Petrenko’s lab does is sift through huge phage libraries to find the phages that will bind breast cancer. They then isolate these peptides and incorporate them on the surface of the breast cancer drug molecules. The drug they work with, Doxil, is a form of the common breast cancer drug Doxorubicin. Doxil is actually composed of a drug-containing core encapsulated by a liposome layer. This layer will bear the peptides that specifically seek the breast cancer cells and then bind to them, delivering their cargo of medicine directly into the breast cancer cells. The purpose of this targeted delivery is to, as much as possible, eliminate the debilitating side effects of cancer drugs. While some other laboratories are experimenting with targeted delivery, he says that that are the only ones using phages for that purpose. Though work had been done with phages for many years, what Dr. Petrenko’s lab is doing is still a cutting edge technology, and they are among the world’s pioneers. Though they are still at the cell culture stage, the results are promising enough that Dr. Petrenko has already received second NIH grant to explore his procedure in relation to lung cancer. Dr. Fagbohun is a quiet, soft spoken man, but he is clearly excited about their work. Though he has trained at a veterinarian and researched poultry viruses as a Fullbright Scholar, he feels his future lies in this field of nano-bioengineering. His path has been straightforward and steeped in the academic world. Olusegun grew up in Ibadan, Nigeria, a large city of around 1.4 million people. He attended prestigious Comprehensive High School in Ayetoro, Nigeria. The school was jointly founded by the Nigerian government and Harvard University, which developed the school’s curriculum. At 17, Olusegun began veterinary school. Rather than a general curriculum like the United States college experience, his University included only one year of basic courses before plunging them into a full veterinary degree program. He received his Master’s degree in Microbiology at the University of Ibadan, and taught virology for some years at that school’s College of Veterinary Medicine before coming to Auburn University as a Fullbright Scholar. At that time, he was here working with the poultry virus called Gumboro disease, with Dr. J.J. Giambrone in the Poultry Science department. A few months later, he was accepted into the Cellular and Molecular Biology program here. When asked why he came back to Auburn, he shrugs. “I feel very comfortable here,” he says. The United States is the place to work on the kinds of research that interests him, and he enjoyed his time at Auburn so much during his previous study, it was a top choice for a doctoral program. “I have lived in a University campus most of my life,” he says. Simply put, Auburn feels like home to him, like it does to so many people from across the world. The Cellular and Molecular Biology program is unique because it is not a department. Rather, it is an interdepartmental program that allows its students to do lab rotations in its constituent departments for one year before deciding where they would like to stay. After a poultry science rotation with his former mentor, Fagbohun went to Pathobiology, and that is where he eventually returned for his Ph.D. Before that lab rotation, he says, he knew nothing about phage display technology, but thought that it sounded exciting. His experience with poultry viruses was helpful, since phages are viruses. Dr. Fagbohun will receive his doctorate in December of 2010 and move on to a postdoctoral position. He hopes to be at the forefront of the emerging nanobiotechnology field, and it looks like that is a good place to be in the future. Talking to him, it is easy to believe that the world of science fiction is moving into the realm of the possible in many ways. Please stand by for your jet pack.